All sarcasm aside, here’s a nice discussion from Apple Support Communities that explains the situation. Whether you decided to look at this discussion or not, the key takeaway is that the 2011 iMac must be connected to another Thunderbolt Mac in order to use Target Display Mode. This essentially makes the feature useless unless you own a 2011 MacBook Pro. There are currently no Thunderbolt adapters, converters, or any other workaround as of this writing that can unlock Target Display Mode to work with the Mini DisplayPort found on earlier Macs. The prior generations of the 27″ iMac allowed users to connect virtually any external video source to the Mini DisplayPort input. This could be accomplished either directly from a DisplayPort source or through a converter. See my DVI-to-Mini DisplayPort Converters: A Ray of Hope for the 27″ iMac, which provides a couple examples of these converters. Target Display Mode enabled the 27″ iMac (Late 2009 and Mid 2010) to be used as an extremely high-resolution multipurpose display. It unlocked many new possibilities for videophiles and gamers alike, making the 27″ iMac an incredible value. Unfortunately, the 21.5″ iMac was left out and does not include this feature. With its native 1920 x 1080 (1080p) display, the 21.5″ iMac is actually more ideal for connecting various HD sources. Now that Thunderbolt is here and “fully compatible” with Mini DisplayPort (it uses the exact same connector), it only seems natural that you would be able to use Target Display Mode over Mini DisplayPort. Those who held out on buying an earlier iMac and purchased the current model are surely disappointed with the current limit of Target Display Mode to only Thunderbolt devices. We can hold our breath and hope that Apple addresses this with an update to OS X 10.6 Snow Leopard, a Firmware Update to the 2011 iMacs, or as another feature added later with the soon-to-arrive Mac OS X 10.7 Lion. In any case, as it now stands Target Display Mode on the 2011 iMac is essentially broken until something changes to enable it to be used with non-Thunderbolt video sources. The good news is that Thunderbolt is new. If Apple plans on providing no workaround, you can be sure that third parties are already at work on this problem in the way of new converters. Thunderbolt is going to be amazing, and Dan Knight couldn’t have said it better in Why FireWire Failed and Thunderbolt Won’t. In this article, and in any other source that fully explains the capabilities of Thunderbolt, you can clearly see the comparisons in this brand new connectivity technology to anything else previously released. Through adapters, virtually any external connection and input/output device is possible. Thunderbolt is an external connection directly to the system bus. Think of it as a gateway similar to that found on a PCI Express (PCIe) expansion slot in a Mac Pro. You can daisy chain up to six Thunderbolt devices to a single port, so it can be compared to having six PCI Express expansion slots available per Thunderbolt port. With that said, high bandwidth storage devices and extremely powerful external video cards will become a reality, making the internal soldered video card in portables such as MacBooks and MacBook Pros no longer an absolute limit to pushing pixels. This makes a Mac equipped with Thunderbolt a much more viable purchase for the future and adds unprecedented expansion possibilities. 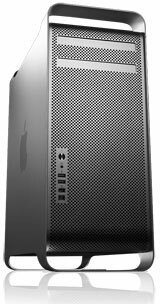 I once envisioned a new, affordable, expandable Intel machine that would be quite similar to the G4 Cube in Re-imagining the Mac Cube for the Intel Era. With the advent of Thunderbolt and the inevitable refresh of the Mac mini that will follow, this has now become a reality. Mark my word – Thunderbolt will bring the Mac full circle and will certainly deliver an amazing next generation of possibilities. Let’s just hope that one of those possibilities will be a fix for Target Display Mode for owners of 2011 iMacs.